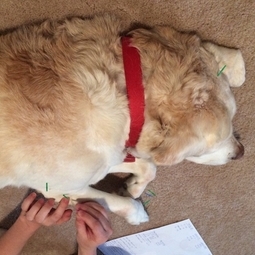 Acupuncture - Veterinary Medical Ctr of Lebanon, Inc.
A complimentary therapy for many health conditions. Acupuncture can provide pain relief, reduce inflammation and symptoms of chronic disease, strengthen the body's immunity,and help to restore a healthy balance. Dr. Evans is a certified acupuncturist through the Chi Institute. Acupuncture is a safe and natural therapy used to treat many conditions, including arthritis, soreness, back pain, neurological disorders, digestive disorders, support of chronic conditions, quality of life care, performance enhancement, and preventative medicine. Very thin sterile needles are used which are comfortable to most patients, and these needles trigger the release of the body's own natural pain killers, increase blood flow, and help to reduce inflammation.